Sometimes a stone or crystal you are strongly drawn to doesn’t feel good, or a stone that felt good previously doesn’t feel good now. The stone or crystal may need to be cleared. Clearing is necessary before using any stone for healing. The clearer the energy of a healing stone, the more powerful it is. Crystals and healing gemstones need to be cleared as soon as they are purchased as well as clearing after every healing. A cleared, ready crystal feels positive and bright, tingly and cold to the touch. A crystal that needs clearing may feel hot, heavy or drained. The clearing process should be carried out until you intuitively feels that the stone has been cleansed, or by feeling the stone’s energy. You should then charge the crystal in sunlight or moonlight (preferably that of a full or a new moon) for at least one full day or night. It is not recommended to utilize water or salt when cleansing certain gems,stones & crystals. Also it is not recommended to place particular gems,stones & crystals in the sunlight, many stones tend to fade their colors in the sun. Also internal fractures may cause your stone to crack or break if placed in the sun. Moonlight is another way of clearing your gemstones. Simply place outside from the Full to the New Moon. Waning Moons are good times to clear crystals, to dispel old energies, but any time works. The amount of time used varies with the sensitivity of the healer and the amount of material from which the stone needs cleansing. Burying your crystal in a cupful of dried herbs will also clear it. Suggested herbs for this are rose petals, sage, frankincense, myrrh, and sandalwood. This is a gentle way to clear crystals, and a pleasant way, but it does take longer than sea salt. Crystals may also be buried into the Earth. This is especially helpful when you feel deep cleansing is needed. Outdoors, simply dig a hole the size of your crystal into the Earth, place your crystal again point down, and cover with soil. The amount of time needed is personal choice. 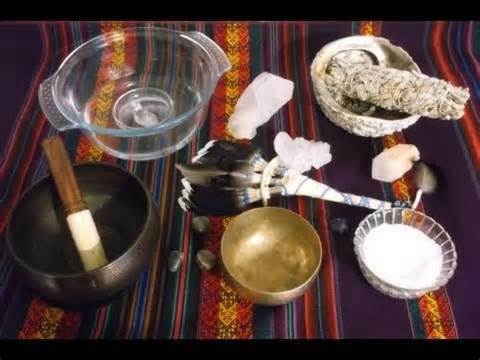 The Sacred Breath- Some like to use this method of ‘blowing away’ any negativity from the stone, simply hold the stone in your hand and blow on it, while blowing ask your higher self to cleanse the crystal. 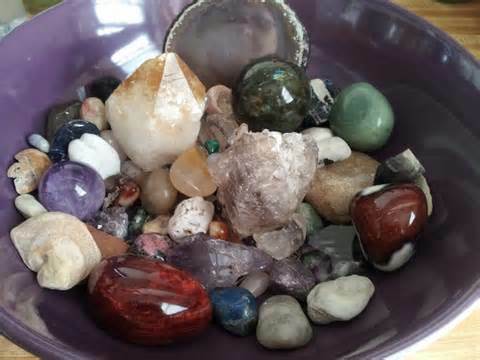 If you are a Reiki practitioner, you can also “Reiki” your stones and crystals, simply by holding them in your hands and setting the intention for your crystals to be cleansed. Hold the stone under running water or in a stream to be purified (points are to face down the drain or down stream to wash the negative energy away), you may also soak in a solution of sea salt and distilled water. Visualize the crystal as sparkly, tingly, cold, and belonging to the healer. *It is not recommended to utilize water or sea salt when cleansing certain gems,stones & crystals. Never use Warm or Hot water, this may fracture or break your crystals.